Traditional harvest festivities in family circle belong to those distinctive Georgian traditions that still live. Despite the fact that nowadays young people prefer to live and work in the cities, in the fall many of them come to their ancestors’ land and grandparents’ homes to meet the whole family and take part in a ritual, which is almost as old as Georgia itself. You may wonder, what is special about harvest, while it’s a normal part of agricultural routine. However, considering how deep the roots of viticulture in Georgia are - 8000 years old tradition is a lot! - one can imagine the meaning of production and consumption of wine for all the Georgians. Taking care of vines requires a lot of effort - no wonder that there is a saying that one needs to shed one’s own sweat over the vineyard to get a good harvest. So rtveli, the harvest time in Georgia, is crowning the natural cycle and starts a new one. 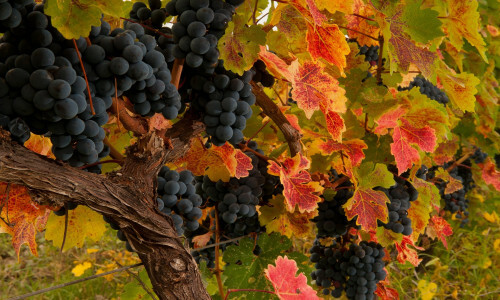 Every guest to Georgia can take part in rtveli - any vineyard owner is pleased by offered help and interest in the process of birth of wine. If you want to be involved into the ancient tradition, you should learn some special words for traditional tools related to winemaking. Godori - an oblong basket, to where one puts the picked grapes. Satskneheli - a wooden tub, where the grapes are being pressed – people usually do it with their feet wearing special footwear. In satskheneli there is a hole, from which the juice flows into a special vessel. Qvevri – a clay vessel, where the grapes undergo the fermentation process. These egg-shaped amphoras are the birthplace of natural flavourful wine! Marani – a cellar, where qvevris are being buried, and the fermentation process goes on. Ready wine is also stored there because of the temperature level. From the harvest products not only wine is being produced. Grape pomace is a base for chacha, strong Georgian brandy, which warms you up if you are cold in winter. Pelamushi and churchkhela, natural Georgian sweets, are made of grape juice and flour. 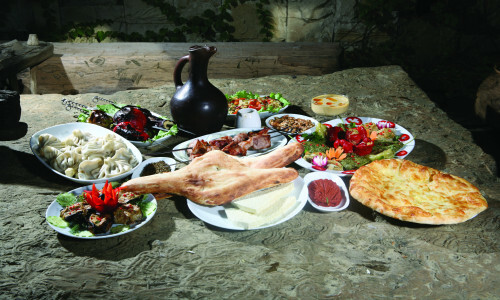 Of course, after hard work on the vineyard, all people gather at the traditional Georgian festive table to have rest and enjoy delicious meals. Lots of mouth watering Georgian dishes, flowing wine and songs – the voice of ancient Georgia can be heard in this eternal flow! To learn more about the history of wine-making traditions of Georgia, check out our website section "Cradle of wine", but better come to Georgia this fall and harvest pleasant emotions and memories!